>Blog>Book Our New Fiji Resort Volivoli And Get 5% Off Your Next Dive Holiday! 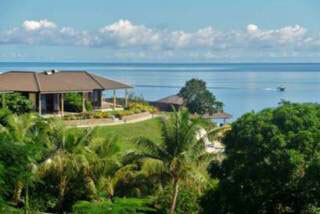 At Dive The World we are happy to announce the launch of our new Fiji Dive Resort VoliVoli. And to celebrate this addition to our line-up of quality Fiji dive resorts we will give you 5% off your next holiday with Dive The World when you book your stay now. But hurry – you must book before 24 July 2012. If you’re looking for world-class dive sites, friendly Fijian hospitality and a secluded atmosphere then the family-run VoliVoli Resort is just what you are looking for. There is a range of comfortable, affordable accommodation to choose from and facilities include a swimming pool, private beach, restaurant and beachside bar. After a great day’s diving with reef sharks and barracuda you can either relax with a good book from the library or if you’re feeling energetic, participate in a range of activities such as Kayaking, beach volleyball, jet skiing, snorkelling, inflatable rides and parasailing. Read more information on the Fiji Dive Resort VoliVoli including details of the accommodation, food, diving and prices. Book your stay at this new resort now and get 5% off your next dive trip! Make your booking by 24 July 2012 and enjoy 5% off your next dive vacation with Dive The World! This offer can be used in addition to other special offers including your Dive The World returning customer 5% discount. If you’d like to spoil yourself with a secluded vacation diving in Fiji, then contact us right away to find out more about the VoliVoli Dive Resort Fiji. Call Dive The World on +66 (0)94 582 7973 / (0)83 505 7794 or send us an email. Ensure you are kept up-to-date with the latest diving news and special offers, subscribe to our e-news now! By Gavin Macaulay on 15 February 2018 .